John Howland was born about 1599, probably in Fenstanton, Huntington. He came on the Mayflower in 1620 as a manservant for Governor John Carver. During the Mayflower's voyage, Howland fell overboard during a storm, and was almost lost at sea--but luckily for his millions of descendants living today (including Presidents George Bush and George W. Bush, and Mrs. Theodore Roosevelt) he managed to grab ahold of the topsail halyards, giving the crew enough time to rescue him with a boathook. It has been traditionally reported that John Howland was born about 1592, based on his reported age at death in the Plymouth Church Records. However, ages at death were often overstated, and that is clearly the case here. John Howland came as a servant for John Carver, which means he was under 25 years old at the time (i.e. he was born after 1595). William Bradford, in the falling-overboard incident, refers to Howland as a "lusty young man", a term that would not likely have applied to a 28-year old given that Bradford himself was only 30--Bradford did call 21-year old John Alden a "young man" though. Howland's wife Elizabeth was born in 1607: a 32-year old marrying a 17-year old is an unlikely circumstance. Howland's last child was born in 1649: a 57-year old Howland would be an unlikely father. All these taken together demonstrate that Howland's age was likely overstated by at least 5 years. Since he signed the Mayflower Compact, we can assume he was probably about 21 in 1620, so the best estimate for his birth would be about 1599. John Howland had several brothers who also came to New England, namely Henry Howland (an ancestor to both Presidents Richard Nixon and Gerald Ford) and Arthur Howland (an ancestor to Winston Churchill). FREEMAN: In the "1633" list of Plymouth freemen John Howland is near the head of the list, among the councillors [ PCR 1:3]. In the 6 March 1636/7 list of Plymouth Colony freemen [ PCR 1:52]. In the Plymouth section of the 1639, 1658 and 29 May 1670 lists of Plymouth Colony freemen [ PCR 5:274, 8:173, 197]. EDUCATION: His inventory included "1 great Bible and Annotations on the 5 Books of Moses" valued at £1 and "Mr. Tindall's Works, Mr. Wilson's Works, 7 more books" valued at £1. OFFICES: Plymouth Colony Assistant, 1 January 1632/3, 1 January 1633/4, 1 January 1634/5 [ PCR 1:5, 21, 32]. Deputy for Plymouth to General Court, 1 June 1641, 28 October 1645, 1 June 1647, 7 June 1648, 8 June 1649, 4 June 1650, 5 June 1651, 3 June 1652, 7 June 1653, 7 March 1653/4, 6 June 1654, 1 August 1654, 8 June 1655, 3 June 1656, 1 June 1658, 4 June 1661, 1 June 1663, 1 June 1666, 5 June 1667 [ PCR 2:16, 94, 117, 123, 144, 154, 167, 3:8, 31, 44, 49, 63, 79, 99, 135, 214, 4:37, 122, 148]. In charge of the fur trading post at Kennebec, 1634 [ MD 2:10-11]. Committe on the fur trade, 3 October 1659 [ PCR 3:170]. In the Plymouth section of the 1643 Plymouth Colony list of men able to bear arms (as "John Howland Sen.") [ PCR 8:187]. ESTATE: In the 1623 Plymouth division of land John Howland received four acres as a passenger on the Mayflower [ PCR 12:4]. In the 1627 Plymouth division of cattle John Howland, his wife Elizabeth Howland, John Howland Junior and Desire Howland were the first four persons in the fourth company [ PCR 12:10]. In the Plymouth tax list of 25 March 1633 John Howland was assessed 18s., and in the list of 27 March 1634 £1 4s. [ PCR 1:9, 27]. John Howland was a Purchaser [ PCR 2:177]. On 4 December 1637 "forty acres of land are granted to Mr. John Howland, lying at the Island Creeke Pond at the western end thereof, with the marsh ground that he useth to mow there" [ PCR 1:70]. On 5 November 1638 the "island called Spectacle, lying upon Green's Harbor, is granted to Mr. John Howland" [ PCR 1:102, 110, 168]. Granted six acres of meadow "at the North Meadow by Jones River" [ PCR 2:49]. In his will, dated 29 May 1672 and proved 6 March 1672/3, "John Howland Seni[o]r of the town of New Plymouth ... being now grown aged, having many infirmities of body upon me," bequeathed to "John Howland my eldest son besides what lands I have already given him, all my right and interest to that one hundred acres of land granted me by the court lying on the eastern side of Taunton River"; to "my son Jabez Howland all those my upland and meadow that I now possess at Satuckett and Paomett"; to "my son Jabez Howland all that my one piece of land that I have lying on the southside of the mill brook"; to "Isaac Howland my youngest son all those my uplands and meadows ... in the town of Middlebery and in a tract of land called the Major's Purchase near Namassakett Ponds which I have bought and purchased of William White of Marshfield"; to "my said son Isacke Howland the one half of my twelve acre lot of meadow that I now have at Winnatucsett River"; to "my dear and loving wife Elizabeth Howland the use and benefit of my now dwelling house in Rockey Nooke in the township of Plymouth ... with the outhousing lands ... uplands and meadow lands ... in the town of Plymouth ... excepting what meadow and upland I have before given to my sons Jabez and Isacke Howland during her natural life"; to "my son Joseph Howland after the decease of my loving wife Elizabeth Howland my aforesaid dwelling house at Rockey Nooke"; to "my daughter Desire Gorum 20s. "; to "my daughter Hope Chipman 20s. "; to "my daughter Elizabeth Dickenson 20s. "; to "my daughter Lydia Browne 20s. "; to "my daughter Hannah Bosworth 20s. "; to "my daughter Ruth Cushman 20s. "; to "my grandchild Elizabeth Howland the daughter of my son John Howland 20s. "; "these legacies given to my daughters [to] be paid by my executrix"; to "my loving wife Elizabeth Howland my debts and legacies being first paid, my whole estate," she to be executrix [ MD 2:70-73, citing PCPR 3:1:49-50]. In her will, dated 17 December 1686 and proved 10 January 1687/8, "Elizabeth Howland of Swanzey ... being seventy nine years of age" bequeathed to "my eldest son John Howland the sum of £5 ... and my book called Mr. Tindale's Works and also one pair of sheets & one pair of pillowbeers and one pair of bedblankets"; to "my son Joseph Howland my stilliards and also one pair of sheets and one pair of pillowbeers"; to "my son Jabez Howland my featherbed & bolster that is in his custody & also one rug & two blankets that belongeth to the said bed & also my great iron pot & pothooks"; to "my son Isaack Howland my book called Willson on the Romanes & one pair of sheets & one pair of pillowbeers & also my great brass kettle already in his possession"; to "my son-in-law Mr. James Browne my great Bible"; to "my daughter Lidia Browne my best featherbed & boulster two pillows & three blankets & a green rug & my small cupboard one pair of andirons & my lesser brass kettle & my small Bible & my book of Mr. Robbinson's Works called Observations Divine & Moral & also my finest pair of sheets & my holland pillowbeers"; to "my daughter Elisabeth Dickenson one pair of sheets & one pair of pillowbeers & one chest"; to "my daughter Hannah Bosworth one pair of sheets & one pair of pillowbeers"; to "my granddaughter Elizabeth Bursley one pair of sheets and one pair of pillowbeers"; to "my grandson Nathanael Howland (the son of Joseph Howland) ... my lot of land with the meadow thereto adjoining ... in the township of Duxbury near Jones River Bridge"; to "my grandson James Browne one iron bar and one iron trammell now in his possession"; to "my grandson Jabez Browne one chest"; to "my granddaughter Dorothy Browne my best chest & my warming pan"; to "my granddaughter Desire Cushman four sheep"; "my wearing clothes linen and woollen" and the residue to "my three daughters Elisabeth Dickenson, Lidia Browne and Hannah Bosworth to be equally divided amongst them"; "my loving son-in-law James Browne and my loving son Jabez Howland" executors [ MD 3:54-57, citing BrPR 1:13-14]. 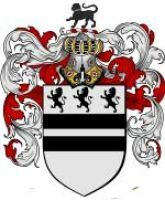 BIRTH: Say 1592, son of Henry and Margaret (_____) Howland of Fenstanton. DEATH: Plymouth 23 February 1672/3 "above eighty years" [ PCR 8:34]. MARRIAGE: Plymouth by about 1624 Elizabeth Tilley, baptized Henlow, Bedfordshire, 30 August 1607, daughter of JOHN TILLEY . She died at Swansea 22 December 1687, aged eighty [ SwVR 27]. i DESIRE, b. say 1624; m. by 1644 John Gorham (eldest child b. Plymouth 2 April 1644 [ MD 5:72]). ii JOHN, b. Plymouth 24 April 1627; m. Plymouth 26 October 1651 Mary Lee [ PCR 8:13]. iii HOPE, b. Plymouth 30 August 1629; m. by about 1646 John Chipman. iv ELIZABETH, b. say 1631; m. (1) Plymouth 13 September 1649 Ephraim Hicks [ PCR 8:8]; m. (2) Plymouth 10 July 1651 John Dickerson [ PCR 8:13]. v LYDIA, b. say 1633; m. by about 1655 James Brown. vi HANNAH, b. say 1637; m. Swansea 6 July 1661 Jonathan Bosworth [ SwVR 23]. vii JOSEPH, b. say 1640; m. Plymouth 7 December 1664 Elizabeth Southworth [ PCR 8:25], daughter of THOMAS SOUTHWORTH . viii JABEZ, b. about 1644 (deposed on 19 July 1680 aged 36 years [ SJC #1915]); m. by 1669 Bethiah Thatcher, daughter of Anthony Thatcher (eldest child b. Plymouth 15 November 1669 [ PVR 668; NYGBR 42:154-57]). ix RUTH, b. say 1646; m. Plymouth 17 November 1664 Thomas Cushman [ PCR 8:25], son of Thomas Cushman. x ISAAC, b. Plymouth 15 November 1649; m. by 1677 Elizabeth Vaughn, daughter of George Vaughn [ TAG 23:24-26]. ASSOCIATIONS: Brother of HENRY HOWLAND and Arthur Howland. it pleased God that he caught hold of the topsail halyards which hung overboard and ran out at length. Yet he held his hold (though he was sundry fathoms under water) till he was hauled up by the same rope to the brim of the water, and then with a boat hook and other means got into the ship again and his life saved. And though he was something ill with it, yet he lived many years after and became a profitable member both in church & commonwealth [ Bradford 59]. In his 1651 accounting on the family of John Carver, Bradford reported that "[h]is servant John Howland married the daughter of John Tilley, Elizabeth, and they are both now living, and their eldest daughter hath four children; and their second daughter one, all living, and other of their children marriageable" [ Bradford 444]. In an undated deposition we learn that in April 1634 John Hocking came to Kennebec and challenged the rights of the Plymouth men to their exclusive trade in that place. Mr. John Howland, in charge of the trading post, went out in their bark with several other men and warned Hocking off, but was taunted and defied. Howland "bid three of his men go cut his cable [Hocking's anchor]," but the flow of the stream was too strong and Howland called them back and added Moses Talbot to the crew. Hocking, seeing that their intent was to cut the cable, "presently put his peice almost to Moyses Talbott's head, which Mr. Howland seeing called to him desiring him not to shoot his man but take himself for his mark saying his men did but that which he commanded them and therefore desired him not to hurt any of them, if any wrong was done it was himself that did it and therefore called again to him to take him for his mark saying he stood very fair, but Hocking would not hear nor look towards our bark, but presently shooteth Moyses in the head, and presently took up his pistol in his hand but the Lord stayed him from doing any further hurt by a shot from our bark himself was presently struck dead being shot near the same place in the head where he had murderously shot Moyses" [ MD 2:10-11]. BIBLIOGRAPHIC NOTE: Because of the multitude of descendants of John Howland, through all ten of his children, the publication of the first five generations of descent from John Howland will occupy many volumes. Elizabeth Pearson White has prepared the first two volumes in this series: John Howland of the Mayflower: Volume 1, The First Five Generations, Documented Descendants Through his first child Desire Howland and her husband Captain John Gorham (Camden, Maine, 1990) and John Howland of the Mayflower: Volume 2, The First Five Generations, Documented Descendants Through his second child John Howland and his wife Mary Lee (Camden, Maine, 1993). In her first volume White argued that John Howland lived for several years in Maine, and that three of his children were born there. Robert S. Wakefield has gathered the evidence that this could not have been the case [ MD 42:15-16]. [S00093] MayflowerHistory.com, Caleb Johnson, (www.mayflowerhistory.com), document online., http://mayflowerhistory.com/tilley-elizabeth/.